As far as cities go, Venice is definitely one of a kind, and this should be enough to answer questions like “Is Venice worth visiting?”! 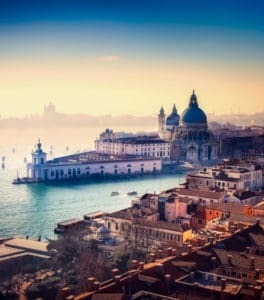 However, we perfectly know that things have changed in the last few years, and many people are starting to wonder whether or not Venice is worth a stop. We know that it might be crowded, especially if you visit it during Carnival or in summer, but we can assure you that Venice is absolutely worth visiting and we’re going to explain here 5 reasons why you definitely should see it at least once in your life. There’s no doubt about it, of course. Venice is a city you won’t find anywhere else on earth. It’s a city built on water, with incredible architecture all around, and a lot of stories to tell. Every corner reveals tales and details to photograph, and you won’t get bored walking through its labyrinthic streets, discovering new buildings and curiosities. Venice represents a different concept of living, where there are no cars, but only boats and people walking across its bridges. You might not like spending your day walking around and visiting museums, but what about cuisine? Here’s an article about Venetian traditional food, that will convince you to come to Venice just to try it! 2. Where else can you experience a gondola ride? Ok, Las Vegas has gondolas, but would you really say that going on a gondola there, is the same as being in Venice? We don’t think so. And if you think that a gondola ride in Venice will be too expensive, there are at least three or four reasons why it is worth it, which we have listed in this article of our blog. Venice hasn’t changed. Ever since its birth, Venice was a city built on water, where the only way to reach a place was by boat, or on foot. Today, it’s exactly the same. If you visit Milan, Rome or any other city in Italy (or even in the world), you’ll notice that the past exists side by side with modernity. In Venice, this only happens during the Biennale – elsewhere in Venice, you’ll be surrounded by its glorious past. Even though we said that Venice is stuck in the past, it doesn’t mean that you won’t find what you’re looking for. If you feel like spending a day shopping, you are spoiled for choice, if you want to dedicate your holiday to art and history there’s no better city than this. Do you like gambling? In Venice, there’s the first casino in Europe. If you’re still not convinced that Venice is worth visiting, we suggest you spend a bit of time discovering how many things you can see related to culture and art, even though the articles of our blog. Venice is the cradle of art, it’s the city where movies like The Tourist were filmed, it’s the city of the Biennale and where the International Film Festival takes place every year. What else you need? Maybe just some tips to get around Venice easily, without getting lost!